Georgina Pendell, one of our Marine Biologists got married last month. As can only be expected this was the most beautiful Shark inspired wedding I have ever seen. 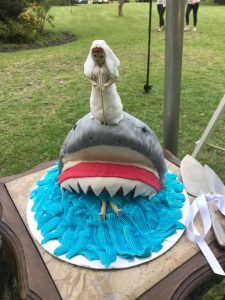 Jan & Georgie made sharks seem like romantic creatures….Here is her story of how she ended up with a Shark Wedding Cake! 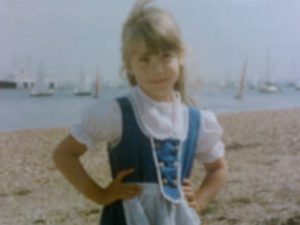 Being a little poser by the seaside in my “Alice in Wonderland” outfit. Like most marine biologists, my story starts with: “Ever since I was a child I loved the ocean and spent hours watching National Geographic documentaries.” I was that kid, the one that begged her parents to adopt a dolphin, drag the whole family on fundraising walks, manipulate the students at school to donate money to the “cuddly dolphins” (This reminds me, after 25 years my poor parents are probably still paying for the adoption of “Whiskey-the-dolphin!). Then when I was older, we discovered the magic of Satellite TV, and with Air Jaws my fascination with dolphins and whales was replaced with an adoration for the ocean’s most mysterious predator, yes, SHARKS! A special memory is watching Air Jaws with my father, he was shouting at the TV “that guy is crazy!” as Dr. Rocky Strong was sitting on a dead whale with great white sharks gnawing on the carcass all around him… I thought, I want to have that man’s job one day! Adoration evolved into obsession. I wanted to be a marine biologist. I wanted to live the documentaries I spent so many hours watching over and over. There was one hurdle between me and my dream….I was not quite an academic….my Biology Teacher nearly choked with laughter when I told her I wanted to be a marine biologist one day. Needless to say, that was motivation enough to work even harder! Sheer discipline, hard work and determination got me into the undergraduate programme at the University of Portsmouth, UK. My research project was conducted on the remote Hoga Island in Southeast Sulawesi, Indonesia with a small group of people as part of the Coral Reef Monitoring Programme conducted by Operation Wallacea. I studied how varying conditions on local reefs affect the presence and behaviour of the Blues­treak cleaner wrasse. This was my first ever experience of the beautiful vibrant colours of a coral reef, teeming with life. I worked on three reefs varying in quality and although one of the reefs was said to be “pristine”, there was something missing….. there were no sharks. In fact, there were very little apex predators there. 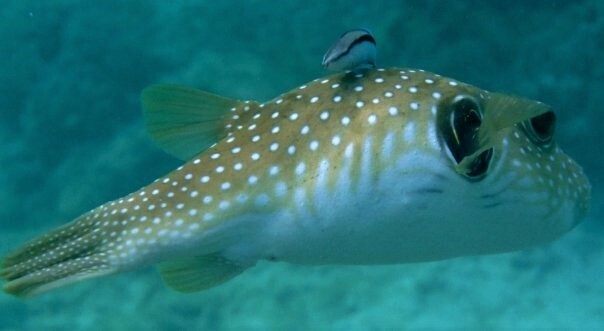 Bluestreak cleaner wrasse giving a very adorable pufferfish a bit of tactile stimulation. Photo taken on Hoga Island, Indonesia. Being an academic ‘late bloomer’ I decided to undertake a part-time MSc in Applied Aquatic Biology (also at the University of Portsmouth) to enhance my skills as a field and laboratory scientist. For my Masters project I utilised my experience in molecular and marine biology to study odorant receptor genes in catsharks. Now I was equipped to fulfil my life long yearning to see the world’s best animal in the wild. 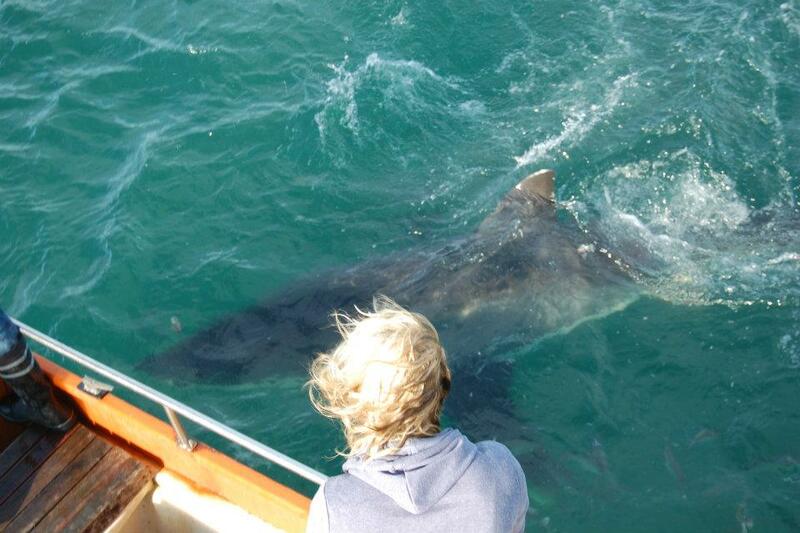 In 2011, I applied for an internship in Mossel Bay with Oceans Research…And then, life paused as I saw my first great white in real life. We had been waiting on the research boat for around 1 hour…. When I hear Jeremy, one of the field specialists shout “SHAAAARK”. I frantically start looking around, I see the swell rolling towards the boat… and what do I see in the swell? A dark shadow coming toward us, as it got closer I see that beautiful iconic dorsal fin start to emerge from the water. Then, there is was, the most breath-taking animal I had ever laid eyes on. I spent a month in Mossel Bay and just fell completely in love with both Sharks and South Africa. Don’t judge me but the day I left I was balling my eyes out. Jeremy actually said to me “Georgie, are you crying because you will miss the sharks?” Of course I was, anyone out there who has experienced the beauty of a great white shark will know exactly how it feels to leave them. I couldn’t stand to be away from these animals so booked another trip to South Africa later on in the year. Me with the craziest sea hair staring at a Great White Shark! One of the pro’s, or cons, about joining a shark based volunteer programme in South Africa, is that you meet lots of shark nerds! Two such oddballs were Ed and Anna.Two British shark nerds, of course we connected! Despite the irritation of my “daaan saath” (down south) accent to their refined Midlands ears; they invited me with to the shark capital of the world – Gansbaai! It didn’t take much convincing to pack my bags for more shark adventures! 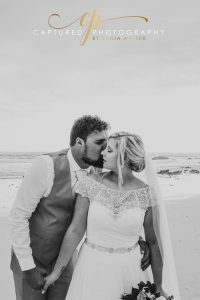 Our Wedding Day – Photography by Sonja Walker, Captured Photography. I loved Gansbaai for so many reasons: great community, beautiful nature, interesting people and of course sharks….and shark people. From 2012, I annually came back to this little town with a big shark population… yes, for sharks, but also a little more than sharks…. Jan worked for White Shark Projects, and as per pre-requirement for a job there, you have to kind of be mad about sharks! It was easy to strike a friendship with this huge guy with hair so curly, it looked like he was wearing an Ushanka (Russian hat). I started spending longer periods of time in Gansbaai, my passion for sharks growing as my fascination with this Afrikaans guy. In 2016, we both realised we like each other’s company for more reasons than interesting shark talks! I found love in a real strange place….. It feels like I am living in a fairy tale. 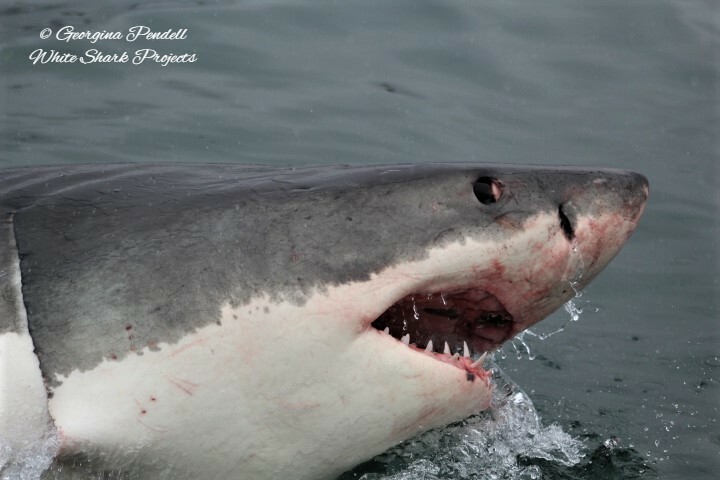 I moved to Gansbaai to be with Jan, I am working as a Marine Biologist at White Shark Projects and I am actually being paid for doing what I love most in the world- talking about sharks! Getting up at ungodly hours to start work is a small price to pay to have the ocean as your office. My enthusiasm and passion for sharks gave me the life I now have…. And this is how I got to where I am now: through a mixture of love and sharks. Photo taken on White Shark Projects cage diving vessel, Shark Team.